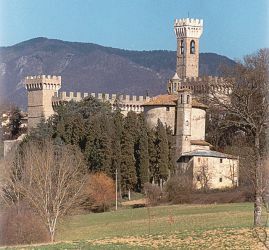 Scarperia is one of the most interesting historic centres in the Mugello zone, the Apennine passes of which connect it to Bologna and the region of Emilia-Romagna. There has also been a revival of the art of hand-made knives, once a major industry here. "Uno dei borghi più belli d'Italia"
as are Pitigliano, Cetona, Loro Ciuffenna, Montefioralle, Anghiari, Panicale, San Casciano dei Bagni and Poppi. Click here for vacation accommodations in Scarperia. • 1299: in order to reorganise and better control its territory, the Council of One Hundred of the Municipality of Florence established two new fortified settlements, one on each side of the Giogo Apennine pass, an important communication route between Florence and the region of Emilia-Romagna. 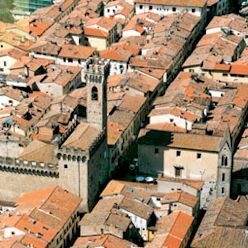 • 1306: Florence defeated the Ubaldini, the ancient feudal lords of the Mugello district, and on 18 July ordered the construction of a new fortress, Castel S. Barnaba, in the locality known as the Scarperia. On 7 September, in the presence of peasants summoned to the new centre, the streets and city walls were sketched out. The village was officially founded on the following day, with a 10-year exemption from taxes and duties for all of those who built their homes there. • 1355: 55 day siege by the Milanese troops of Giovanni Oleggio. • 1415: Scarperia became the seat of a Vicar, representative of the administrative and judicial power of Florence, and the castle was enlarged to accommodate him. Over time, all of the vicars left their blazons in the palace, either sculpted or painted. The vicariate of Scarperia included the podestà jurisdictions of Barberino di Mugello, Borgo S. Lorenzo, Campi, Carmignano, Dicomano, S. Godenzo, Sesto Fiorentino, Fiesole and Vicchio. Commercial activity in Scarperia expanded thanks to its strategic location along the Giogo road, which leads to the Emilia regions and to northern Italy. 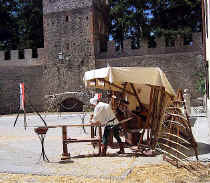 In the 15 C and 16 C, the Scarperia housed numerous hospices, as well as many workshops, particularly those for forging iron and producing agricultural instruments and knives. • 1542: a ruinous earthquake damaged the city walls and almost all civic and religious structures. The following years were devoted to reconstruction. • 1551: the population of Scarperia was 978. • 1752: in order to improve trans-Apennine transit conditions, the new Lorraine government of Florence constructed the Futa carriage road, cutting off Scarperia from the flow of traffic which had made its fortune. Public houses, hotels and taverns went out of business, and life became difficult for the knife-makers as well. In the first decades of the 19 C, only 50 knife-makers remained. • 1908: a law prohibiting the trade and use of pocket knives longer than a palm's length reduced the artisanal knife-making industry to almost nothing. B&B rooms, vacation rentals, holiday apartments, farmhouses, villas with private pool for your holiday in Tuscany - click here. From the 15 C onwards, Scarperia, in the "New Land" of the Florentines, was a vicariate and therefore housed the offices of the Florentine Civil Service for this large part of the Mugello. The Medici family, whose policy was to maintain progressive control of the Republican Magistrature, was particularly interested in holding the office and appointing a member of a loyal family as Vicar. The members of these families took turns running the office throughout the 15 C. The heart of the fortified settlement is the Vicars Palace. Its residential section on the side facing the square, stark and turreted, presents a 14 C plan, while the fortified section lies behind. Palazzo dei Vicari is a 14 C structure that has undergone numerous transformations and renovations throughout the centuries. Two large walls form a vast internal courtyard connecting the palace to the donjon along the western wall; unfortunately only some stretches of the walls are well-preserved. The entire palace complex is fitted out with scarp walls while a slender tower, with merlons and corbels, soars from the right corner of the façade facing the square. Restoration work after the earthquake of 1929 rendered the palace similar to Florence's Palazzo Vecchio. The façade is adorned with the numerous blazons of the vicars who governed Scarperia, evidence of how much the office was sought after by even the most powerful Florentines. Every vicar was under obligation to leave a representation of his family blazon on the palace, and some interesting examples include the glazed earthenware blazons from the Benedetto Buglioni and Della Robbia workshops. The palace interior has trimmings and frescoes from the Renaissance period which contrast with the palace's rugged external appearance. In the first room on the upper floor we find a Madonna and Child with Saints (1554) by the Ghirlandaio school. It is now the home of a valuable historical archive and of the Museum of Cutting Blades, Scarperia being a famous centre of knife production. The Palace of the Vicars overlooks the main piazza and two noteworthy religious structures. 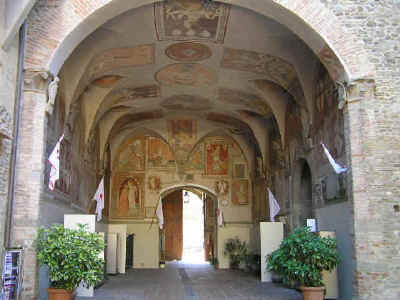 The first is the Propositura, founded by Friar Napoleone dei Galluzzi in 1326 and dedicated to Saints Jacob and Philip. The church, enlarged in 1870 and redesigned by the architect Mario Falcini, has a marble roundel by Benedetto da Maiano, a tabernacle by Mino da Fiesole and a crucifix by Sansovino, as well as numerous paintings. The other structure is the Oratory of the Madonna di Piazza, dating from about 1320. It was here that the solemn swearing in of the Vicars took place, when they took office and received the oath of obedience from the Podestàs. At the centre of the chapel, on the ground floor, there is a late-Gothic tabernacle with spiral columns from about 1490. It houses the Madonna di Piazza, which, according to tradition, was discovered in the well of the piazza. Also worth visiting are the Oratory of the Madonna dei Terremoti and the Oratory of the Madonna del Vivaio, on the road leading to Sant'Agata. 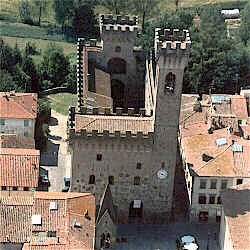 Nearby stands the Torrino: a medieval tower surrounded by a charming Italian-style garden. The village of Sant'Agata is near Scarperia. It is dominated by a lovely 12 C Romanesque parish church, considered the most important sacred structure in the entire Mugello district. The interior preserves a baptismal box dating to 1175, constructed together with the pulpit panels and paintings by Jacopo di Cione and Bitti di Lorenzo. The church has a unique gabled wooden roof and was constructed in albarese stone, with decorations in sandstone and green serpentine. 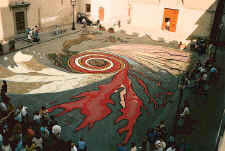 Infiorata on the last Sunday of May - the streets of the Scarperia are decorated with flowers petals during the night before to illustrate a theme that changes every year. Smaller but just as pleasing as the similar event at Spello on Corpus Domini. 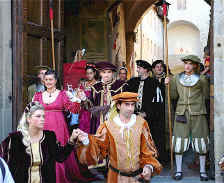 Dicotto and Renaissance festival - first Sunday of September and 8 September. This events celebrates the founding of Scarperia, with the main parades, flag throwing and games taking place on 8 September. 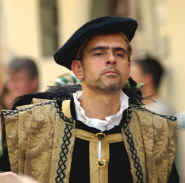 A large part of the population participates in Renaissance costume.